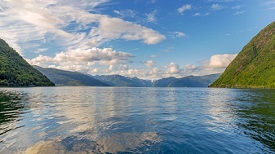 Sognefjord is the largest and best known fjord in Norway. It extends from the coast, just north of Bergen, to the mountains of the Jotunheimen National Park and the blue ice of the Jostedalsbreen National Park. The mountains along the fjord are a popular hiking destination and visitors to the area will see some of the most breath-taking scenery in the world. There are strong food traditions in the Sognefjord area, and it is particularly well known for the high quality of its fruit, berries, lamb, game, mountain trout and goat cheese.